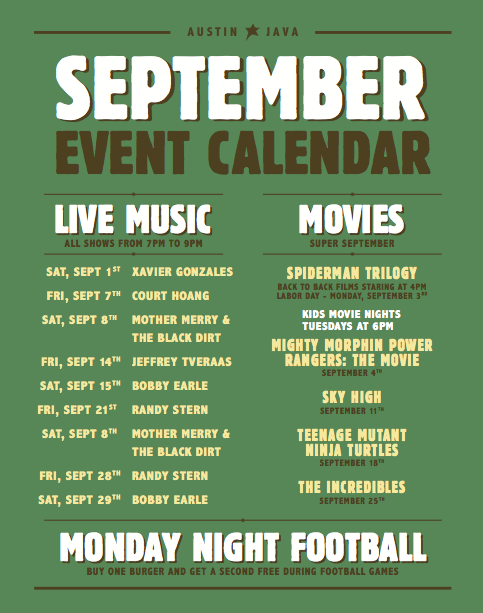 Super September: Events at Austin Java Barton Springs | Catch the Buzz at Austin Java! This September is going to be super. Wanna know why? We’re playing some great family-friendly superhero movies in our Tree Room all month. We’re also going to be showing Monday Night Football all season long. You don’t have to grill out; come and get BOGO burgers instead! Every Monday: Monday Night Football (starting 9/10) and BOGO Burgers. Kids eat free! We’ll be featuring BOGO burgers and kids will eat free, too! Kids Movie Nights : Tuesdays @ 6pm – Kids eat FREE!